My attempt to break free of the daily grind and live a better life. Follow my progress and get tips, tools and tales to help you have an amazing life. First of all apologies for not posting for a couple of weeks. I've been a little busy working on my current big project. I'm about a week away from completing the sale of my London flat. This process started over 5 months ago, so it's taken quite a while and has been a bit of a rollercoaster. A few years ago I read a fascinating book, Authentic: How to Make a Living by Being Yourself which talked about the French origins of the word "mortgage". Mort = Death, Gage = Pledge. Mortgate = Death-pledge. This phrase lodged itself deep inside my head. For many people, myself included, a mortgage is a big trade. We're effectively exchanging a huge portion of scarcest commodity (our time) to make money to service a pledge which makes the banks rich and often goes on till we die (or are close to dying). Think about that for a minute. It's a bit scary! But property is a great investment right? And highly leveraged debt (mortgage) is the only way to get your hands on it!? Well, yes and no. I had a very practical financial education from reading books such as Rich Dad, Poor Dad . If you struggle with money I'd strongly recommend reading these books (they were a huge help for me). They contain sound strategies on how to add property into a portfolio and make money. But they also point out that your own main property is rarely an investment, it's actually a financial liability i.e. it costs you money each month (unless you totally exit the market when you're up, which most never do). For me, owning property has an effect of tying me to a location and tying me into owning property. It's a cycle. You own a property to store yourself and your stuff. As you get older you collect more stuff (and maybe your family grows), so you get a bigger place to store more stuff. The more stuff you have the bigger headache it becomes to change location. You lose your freedom and start to wonder if you own your property and stuff, or it owns you. Don't get me wrong, I too dream of having the perfect home, in the perfect location where I can settle down, grow my own food and do whatever I feel. It's just that right now I'd rather spend my time having amazing experiences and investing my time into creating things of real value that will hopefully mean I won't need to get another mortgage. So here I am now proceeding break the cycle, selling my property and getting rid of all the stuff I store for no reason and hardly use. I no longer want to trade a huge part of my time/life to service a mortgage that simply makes bankers rich via the huge interest payments. I no longer want to be tied to one place. If I'm honest it's been much harder than I thought it would be. I've found it heart-wrenching to get rid of things that brought back sentimental memories. I've found it hard to have to give away or destroy ancient technology that cost a small fortune when I bought it, because it's worthless now and no one wants it. The process of selling property is still incredibly antiquated, time-consuming and riddled with extortionate fees that eat into your finances. But on the positive side it's exciting to see 20 people simultaneously checking out a Google spreadsheet of everything you have for sale in realtime. It's great to meet new people with similar interests, through sites like gumtree.com, who want to make use of your stuff. It's great to give stuff to charity and see it being used again. It's great to turn the trash into cash. Most importantly it's wonderful to gain a huge sense of freedom from saying goodbye to all the useless stuff. Getting rid of stuff feels good! Freedom is the real goal we're all seeking isn't it? From now on my mission is to be highly selective with anything I'm considering purchasing. Do I really need it? How will it add value to my life? How much space will it consume? Will it fit in my Digital Nomad toolkit? How will I get rid of it!? I'm continuing to ruthlessly streamline the things I have, if it's not used then it shouldn't be in my life. 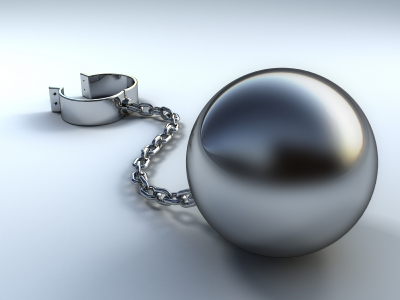 I'm cutting the chains of property and junk to allow me the freedom to live life how and where I want to. I'm also finding lots of other people are on a similar journey. Here's Sean Bonner's recent Ted talk where he shares his own motivations and experiences (to a fairly tough crowd). Have a think today about what you really need in your life and if superfluous stuff might be holding you back from living your life to the maximum. Congratulations Michael, it takes guts to cut the emotional ties to your 'things'. I know you're going to feel great once you're finally there. I'm actually quite jealous. Nay inspired. 5 EASY ways to be happier and more alive TODAY! The importance of reconnecting with old friends, before it's too late. 2011 begins: How's your first day back at work?